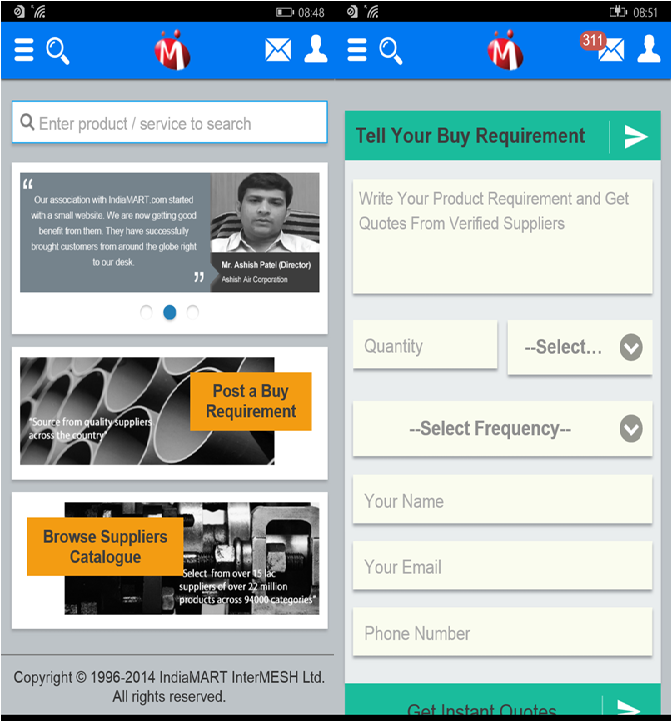 New Delhi: IndiaMART, India’s leading online marketplace for businesses, launched its mobile app on Windows Operating System (Windows 08 and above). Windows users can download the app from Windows Store for free of cost. The app would assist the users in finding the right business partners, even while on the move. Buyers could easily fulfill their requirements by searching for relevant suppliers, comparing prices, sending enquiries, posting requirements, etc., anytime and anywhere, by using a smart and intuitive, yet simple interface. IndiaMART is India’s largest online marketplace, connecting global buyers with suppliers (small and medium sized businesses). The company offers platform & tools to over 1.5 million suppliers to generate business leads from over 10 million buyers, who use the platform to find reliable & competitive suppliers. The company has over 2600 employees located across 40+ offices in the country. Its existing investors include Intel Capital and Bennett, Coleman & Co. Ltd.